Sometimes, despite your best efforts, a negotiation doesn’t go your way. Perhaps a customer pushed for a steeper discount than you wanted to give, or a potential client went with a competitor’s approach to a project. In the face of a disappointment — one where you might appear to be the “loser” — how do you save face? How do you make sure your reputation isn’t damaged and the relationship with your counterpart is intact? Don’t worry too much about your negotiating prowess just because you lost this round. “A reputation comes from consistent behavior,” says Jeff Weiss, founding partner at Vantage Partners, a Boston-based consultancy specializing in corporate negotiations, and author of the HBR Guide to Negotiating. If you learn from the experience, there’s value to be had. A good way to start is by abandoning the adversarial mindset. 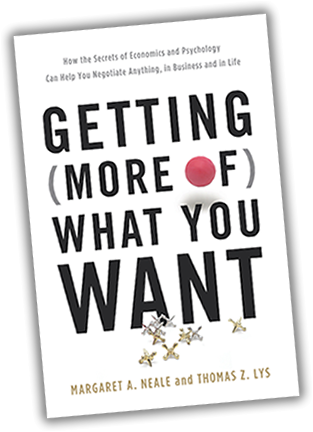 “If all you’re thinking about is saving face, you’ve already made the negotiation and its aftermath into a battle,” says Margaret Neale, the Adams Distinguished Professor of Management at Stanford Graduate School of Business and coauthor of Getting (More of) What You Want. Think instead in terms of solutions so that your approach “becomes about problem solving rather than someone trying to win.” That’s where real win-win scenarios begin to emerge. 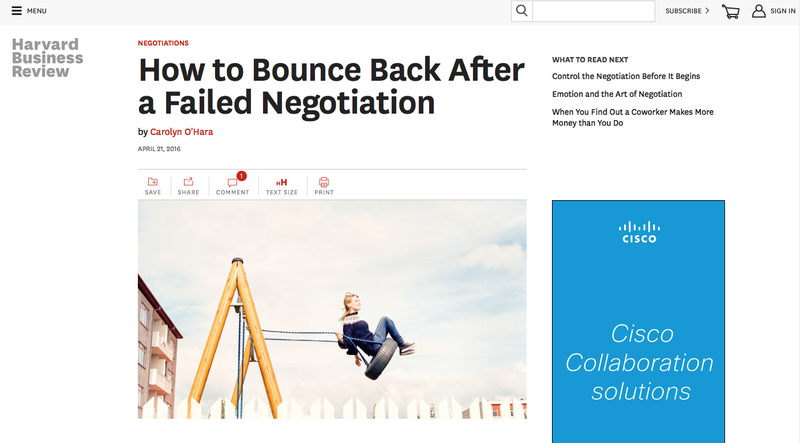 Here’s how to bounce back when a negotiation doesn’t go your way. You may not have “won” on the terms you came to the table with, but there may be some unexplored upside that you haven’t yet considered. “You’re never going to get 100% of what you want,” says Neale. But the best negotiators will find value and benefits in unexpected places. Perhaps you aren’t getting as big an order as you’d like but you’ve cemented a valuable client relationship going forward. “Ask yourself if you can tie some other detail to a piece of the deal,” suggests Weiss. “Are there other terms and conditions where you can balance this out in some way or make some sort of a trade?” That doesn’t mean frantically trying to renegotiate unfavorable terms, which could make you appear desperate. But it does mean thinking about how, for example, the lower profits you’re accepting might be balanced out by opening up new markets. So you didn’t land the big client. Don’t sequester yourself out of frustration. Doing so is unhelpful and prevents you from controlling the narrative with your employees and managers. “Consider whether there are people internally you need to talk to, to get out ahead of this,” says Weiss. “Ask yourself whether there is anything you need to convey to your colleagues about why this happened and what it means.” Neale agrees, adding that being open about missteps is particularly important for executives, who often serve as role models. “Both learning from your mistakes and admitting to those mistakes are important for being a better leader,” she says. If you’re transparent, then your employees are more likely to do the same when a negotiation doesn’t go their way. Don’t think about this disappointment as the end of the story. “When you don’t get the outcome you want,” says Neale, “set up for the next negotiation.” While you’re still at the table, position yourself for the next deal. “You might frame it as a game of favors and ledgers,” says Weiss. For example, you might stress that the client has gotten a good deal from you because you’ve worked together for so long and you value their business. Or that because they’ve helped you solve problems in the past, you’re helping them solve a problem now. Try to focus the conversation on the road ahead. “You might say, ‘This one is a bit lopsided, but we can start thinking now about the next negotiation,’” says Weiss. That way you’re expanding this particular negotiation into a series of conversations. Be transparent with your employees and managers about why this round didn’t go your way. They’ll appreciate your honesty, and it’ll help you spot missteps. Position this disappointing outcome with your counterpart as a setup for the next negotiation. Reflect on why you felt outmaneuvered, and take steps to prepare more thoroughly for next time. Assume your reputation is made by this deal alone. Frantically try to renegotiate unfavorable terms. You’ll look desperate and possibly reckless. Dwell on your frustration — get ready for the next deal. Sebastian Dupéré, the head of a Montreal-based steam cleaner company with sales in six countries, knew that his COO was one of his most valuable employees. But when it came time for contract negotiations, Dupéré instinctively played hardball, even though the COO was performing well and was, even by Dupéré’s account, underpaid. “We just didn’t have the foresight to think about how life would be without him,” says Dupéré. “We took him for granted.” When the COO walked, it was a wake-up call. Dupéré knew he needed to head off further departures as well as stress and intrigue over the COO’s exit within the company; the executive had been respected and well liked. So Dupéré decided to be as honest and transparent as possible about how he and his fellow executives had behaved — and what they’d learned from the misstep. “We felt as if it was in our best interest to be very up front,” Dupéré says. They brought in different teams one at a time and said, This is what happened. We had a contract negotiation, and we made a mistake. We undervalued this employee. And we’ve learned from our mistake. It was clear that employees appreciated the transparency, even if they didn’t agree with the outcome. “I got two emails right after the meetings, saying, ‘Thank you for being honest with us. I appreciate it,’” says Dupéré. He also reached out to the former COO to rebuild bridges. They ended up golfing and now see each other on a regular basis. “There’s a warm relationship there more than anything else,” says Dupéré. The two still frequently consult each other informally on business matters. The investor had a great deal of operational experience and could offer consulting, assistance with the company’s pricing structure, and introductions for relationships that would be helpful. Ultimately, Spector decided to keep the negotiations open because of the benefits the investor brought to the table.